Do you have a special breakfast you make only on holiday mornings? One that takes a little extra time. In this house, Hidden Eggs appear only two or three times a year and every time we ask, “Why don’t we have this more often?” I learned to make Hidden Eggs in Tepoztlan. They were served for breakfast only once and it started a fire in me (literally – that’s a very spicy sauce). I had to learn to make these magical eggs. The lovely Tere, cooking the little treasures with ease, was clear with me. Before I could make hidden eggs, I had to learn to make tortillas. 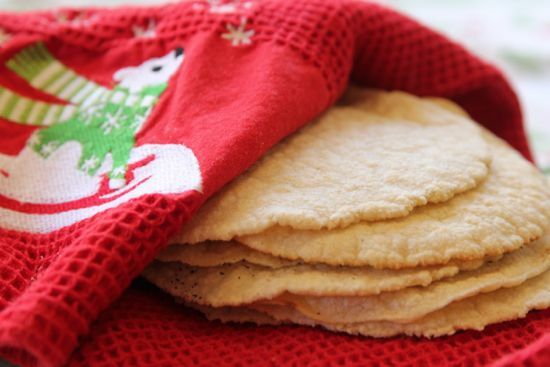 If you’ve never made tortillas, this is one resolution worth making in 2014. 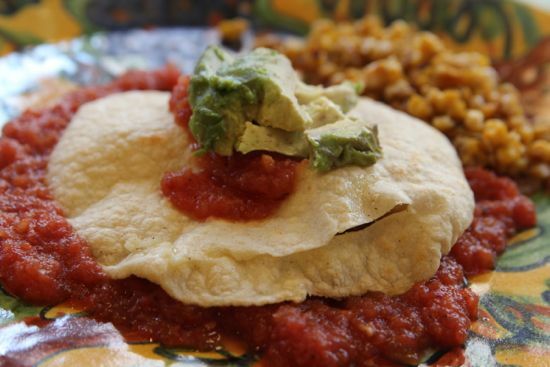 (Don’t worry, I’ve got a work-around for you if making tortillas isn’t on your bucket list.) If you’re ready for a little kitchen fun, here’s the recipe and the technique, and the reason this isn’t a daily endeavor. I use a cast iron griddle, called a comal. There are all sorts in use across Mexico, thin pieces of metal and heavy pieces of cast iron. A cast iron skillet works, a griddle is great. Use a dry pan, not oiled, but well seasoned. Keep the comal over medium heat. 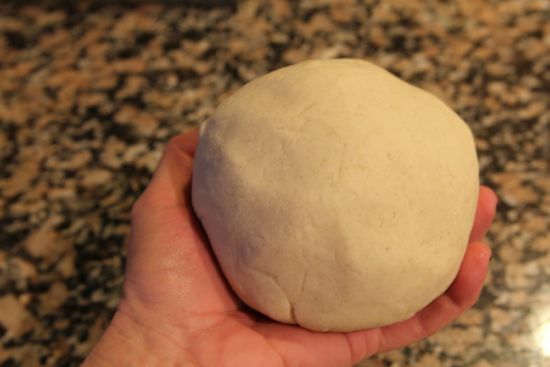 Make walnut sized balls of dough, rolling it between your palms. Keep the dough covered with a tea towel to avoid drying out. Form the tortillas in a press, slice a ziplock bag along the seams and place it in the tortilla press. 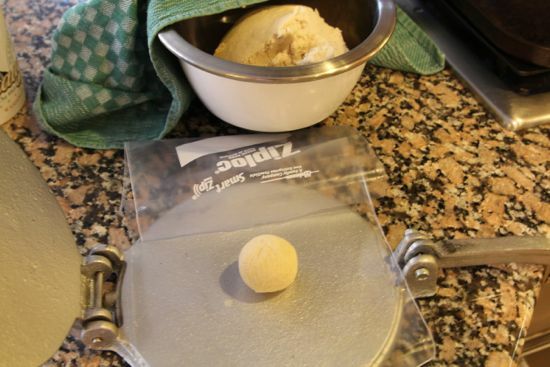 Place the ball of dough between the two pieces of plastic , close the tortilla press and press the clamp down firmly. Peel away one side of the plastic, then place the tortilla in the other hand and peel away the other piece of the plastic bag. Now, deftly unfurl the tortilla onto the griddle. Peek underneath the tortilla and when it is freckled with a few white spots, flip it over. In Mexico, they use their fingers. I use a spatula. In a couple of minutes, the tortilla will puff up, if all is right with the universe (and your dough is the right mix of water and masa). Some puff more than others. Some won’t puff. 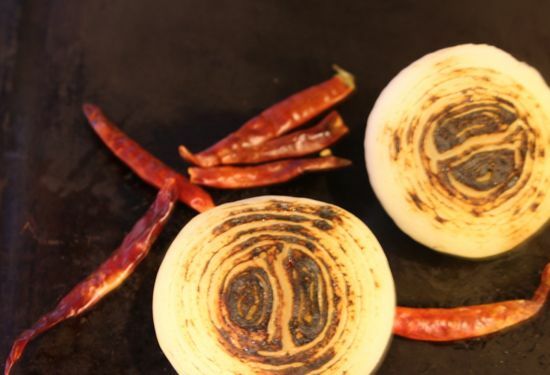 When the comal side is freckled slightly toasty tan here and there, flip the tortilla again for a minute or two, then place in a stack and wrap in a napkin to stay warm. Keep practicing. You’ll want plenty to sop up the sauce, and, while you’re cooking, one of those warm tortillas slathered with salted butter is a good reward. Make at least a dozen tortillas. Set aside six balls of tortilla dough for the hidden eggs. When the sauce is ready, get ready to make the hidden eggs. Put a tortilla on the comal. When one puffs up fully, pluck it from the griddle and slice it open along the puff, then pour in a raw egg. Ha! Yes. Seriously. It’s so fun and funny and nearly impossible. And utterly cool when it works. Slip the tortilla carefully back on the comal and let it cook for five minutes. The bottom of the tortilla will toast a little, the egg will cook through. Flip it if you’re feeling fancy. The photo above shows an escapee egg. 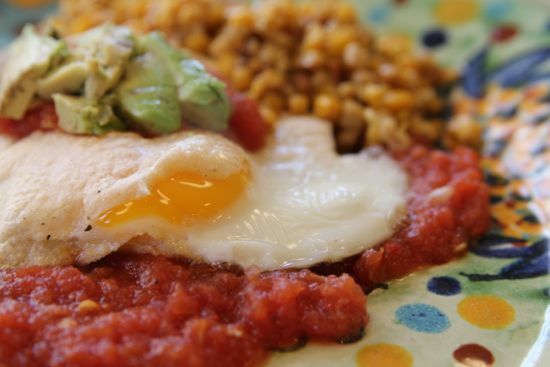 Plate the tortilla with the hidden egg atop a puddle of the spicy salsa. Dab the top of the egg filled tortilla with some additional salsa and the avocado. Serve two hidden eggs per person, but serve them sequentially, so they are piping hot. And if this is all seems like just a lot of fuss, here’s the shortcut. 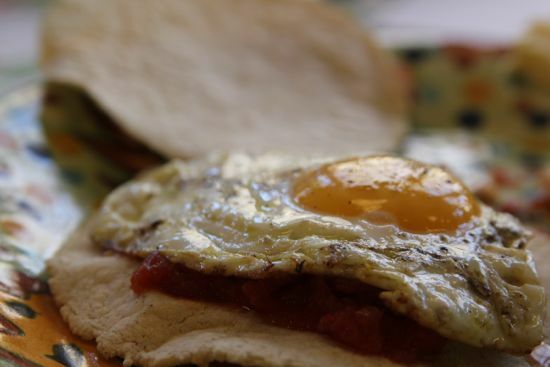 Make the salsa, fry the egg, heat store bought corn tortillas and stack ’em up for sopping. Plate like this: Salsa. Tortilla. Fried egg. Tortilla. Salsa. Avocado. Ta-da. PS Are you coming to Food Blog South? I’ll be there and hope to meet you. I’ll be doing a session about my blog to book path. If you want to attend, use this registration link for a 10% discount. One of the most delicious dishes I’ve ever had for breakfast. Alternate plan will keep people from weeping when they encounter the inevitable hiccup. My family’s traditional Greek holiday breakfast is a labor of love — Loukoumades, yeasted puffs, fried to order until golden and served with a drizzle of warm honey and a sprinkle of cinnamon. I mix the batter up the night before according to the recipe handed down from my grandmother to my mom. In the morning, I’m the fry chef, at my station until the last bit of bubbly batter is used up. Served with side of ham or bacon, it’s what we look forward to once a year. This looks fantastic! Must make it. Our traditional Christmas breakfast is eggs benedict with toasted english muffins, poached eggs, Canadian bacon and homemade hollandaise sauce. Nothing like a little butter and egg warm-up before the holiday ham dinner! Oh yes, love the look of this 🙂 Just minus the chili for me! Great photos Cathy too. Cathy, these look fantastic. This is definitely on my list of must-makes. Happy New Year wishes to you and yours! YUM! Thanks for this post. Can’t wait to try it.